Amazon India recently launched the Echo devices in India including Echo Dot, Echo and Echo Plus. Echo devices is a hands-free, voice controlled device that is powered by Alexa. Home Assistant is pretty new in India and the market size is very thin. Amazon decided to take the risk and launched the all the Echo series. I decided to try the new Assistant device by Amazon, so pre-order the Amazon Echo Dot. The Amazon Echo Dot is the cheapest device in Echo series and it cost me Rs. 3100. Here is my Amazon Echo Dot India review after 1.5 weeks of use. Amazon Echo Dot has a sleek and compact design, available in either black or white. It made up of plastic with speaker grill at the bottom and top with lightning around it. There is hardware button on the top (Mute, Volume Up, Volume Down & Action word). 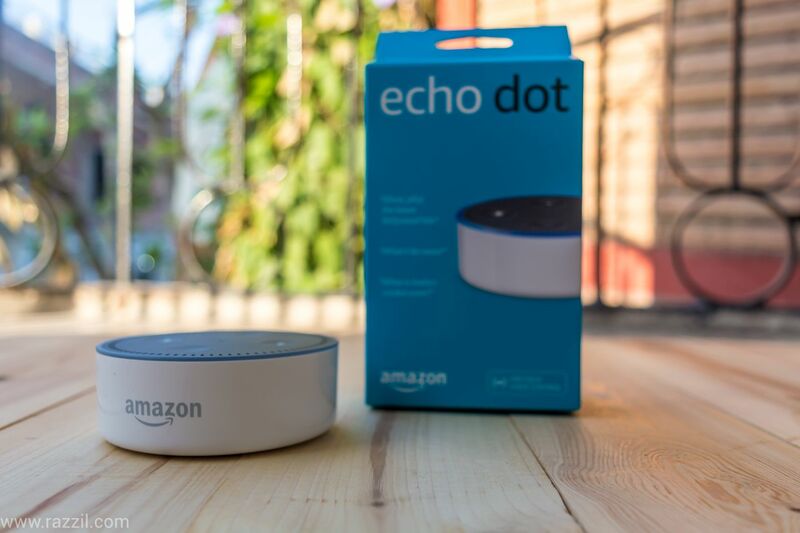 The Echo Dot is using 7 microphones with noise cancellation technology that helps the device to detect sound from any direction. At the back of the device, you’ll find 3.5 mm port so that you can connect the External speaker. 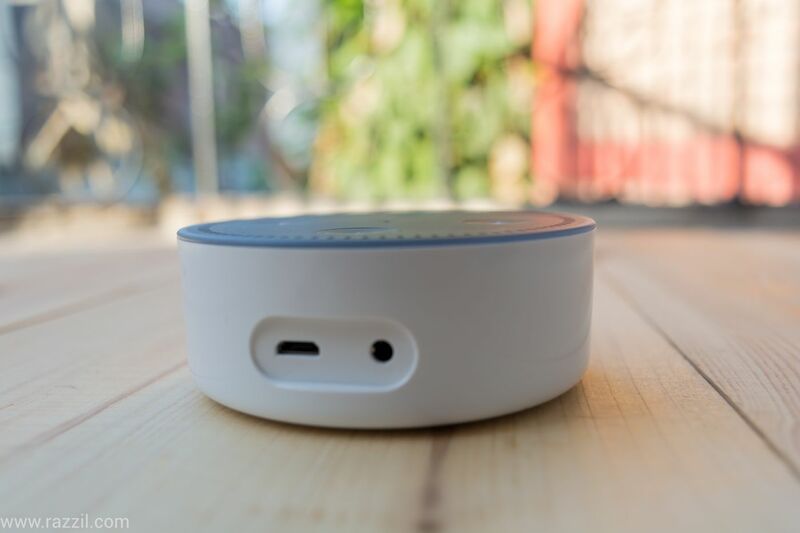 There is also built-in Bluetooth if you like to connect the Bluetooth speaker. The First time setup is very simple, first, connect the Echo Dot to the power and download the Amazon Alexa app on your Android or iOS. When you open the app, it asks you to setup the device. Select the Echo model and follow the on-screen instructions to setup the connection with your existing Wi-Fi Network. Once the setup is finished, the yellow light will go away and blue light will light up. If there is any new firmware then it’ll automatically download and install on the device. The speaker will restart after the update. There is no inbuilt battery in the system, so you’ve to continuously provide the power. 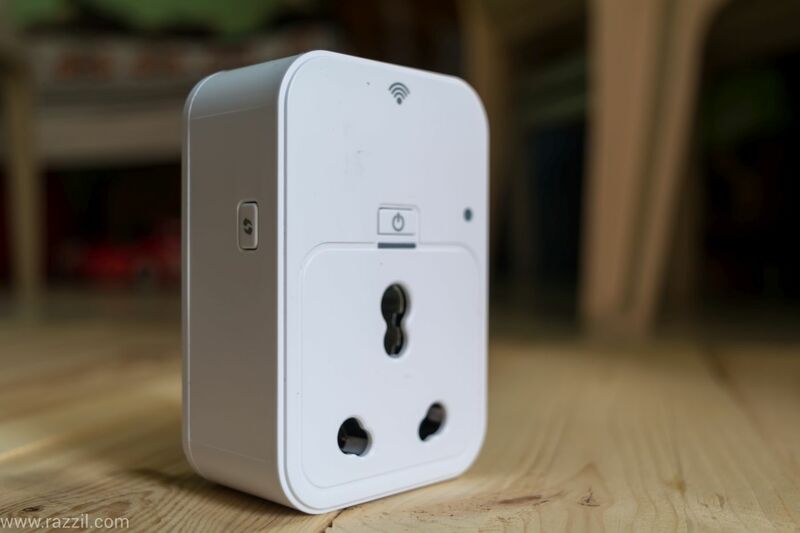 Now the place the device anywhere in your home but make sure it’s in the Wi-Fi range. Amazon Echo Dot is the little device that can blend anywhere in the room. The sound output is pretty loud through it’s not great if you’re music buff but still pretty impressive for the living room. The 7 microphone around the device can detect the voice from a far-off distance. You can even say it loud from other room and it can still hear and process your request. Through the voice recognition is not that great as compared to Google Voice but if you say it clearly, Amazon will correctly process your request. Alexa is the brain behind the Amazon Echo. It runs on cloud and responds every request you asked. Alexa now supports the English voice local accent so that it can accurately detect the voice command. It supports music titles, names, and places in additional non-English languages; local knowledge; and local skills from Indian developers. If you’re in the metro city then you can order the Cars, book a dinner table or order a food. Right now very limited useful skills are available for Indian users. However Asking questions, playing music, news, sports news works well. Despite the good support from Indian brands, the Echo dot failed to answer basic questions like Traffic updates, stock price, and some songs. Amazon did a great job in Smart Home department, with the launch of the Echo devices. There are many Smart Home Appliance already available on the Amazon at a reasonable price. Some popular brands such as Phillips, Oakter, Syska, D-link and tp-link plugs and lights are already compatible with the Echo. 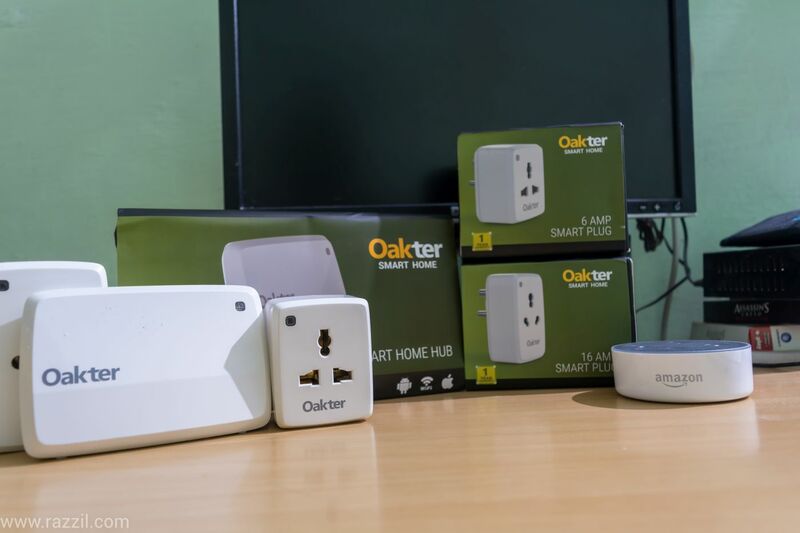 Right now I’m reviewing the Oakter Smart Home Kit and D-link Smart Plug with the Echo Dot. The Integration is very simple and works really good. Just say the command “Alexa Turn off the geyser” and it’ll immediately switch off the geyser within in 1-2 seconds. No doubt the Amazon Echo Dot is brilliant device and special Thanks to Amazon to launch it very soon. Smart Home thing is still in the early stage in India and you must make your mind before purchasing the device. If you already have the Smart Plugs & light or planning to buy then the Echo Dot becomes the extremely useful device. 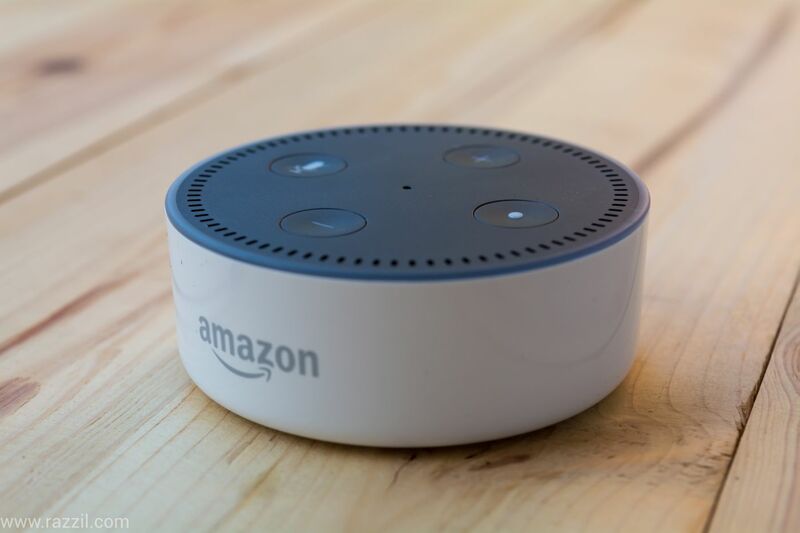 If you’re no longer want to invest in Smart Home appliance then the Echo Dot will remain a toy for you which gives the answer, play music and that’s it. All these functionalities are already on your phone so think before you buy. I built up smart things around me and the Echo Dot is extremely useful for me. My family uses this to turn on the geyser and lights and kids used this to play music. Powerful device with useful features and Smart Home integration with many Smart Plugs and Lights. The Echo devices will surely push the Internet of Things in the fast lane and force the other companies to launch more compatible devices in future.